After the Apocalypse is a long-term project Caroline has developed and is currently running with the Additional Support Needs class from Montrose Academy. The pupils have been coming over to the museum one afternoon a week since February and will be doing so until November when their work will be exhibited to the public. This engagement not only allows the pupils to learn more about the huge range of careers available in the museum and cultural sector, but also have fun experiences which allow them to develop soft skills useful in an industry, i.e. team work, research skills, communication, perseverance, responsibility, decisiveness, problem solving and negotiation, among others. Montrose Museum & Art Gallery also gain from the project; Caroline gains an opportunity to develop personally and professionally, including project management experience and the museum can gain up-to-date insight into a key demographic by using the engagement with young people as a kind of customer focus group. There is also likely to be increase in visitors when they unveil the new, fun and quirky exhibit to the public, not just the friends and family of the pupils who helped to curate it, but many others as well. The exhibit will open 7th December and run until March 2020. Below is Caroline’s description of the project. First we introduced the pupils to the museum and spoke a little bit about the sorts of things we do here and how important exhibitions are. Then I explained the idea behind the ‘After the Apocalypse’ exhibition – that they would be thinking about the objects from our collection that they would need to use again after there was no internet, electricity, running water or other basic infrastructure. Luckily they had just been studying about natural disasters so this fitted in quite well with that, but we quickly came to the conclusion that we would imagine life after a zombie apocalypse specifically. This means we are focused more on survival than re-building society so the core areas we are looking at are weapons and food. There was also mention of the need for entertainment as well (which is perhaps a bit less bleak!). I wrote notes about their discussion on post-it notes so we could keep track of our core concepts throughout the project. Based on our discussions at the previous two sessions I have looked out objects from our collection that the group can select for After the Apocalypse. I’m starting with weapons from the collection and then will move on to food-related items. For this I get the objects out, one at a time, for the group to look at. We then decide what it is, reasons that it would be useful after the apocalypse, reasons it would not be useful after the apocalypse and taking these reasons into account, whether we want it in our exhibition. I have the category heading stuck onto the wall and again I use post-its to keep track of what we have discussed. 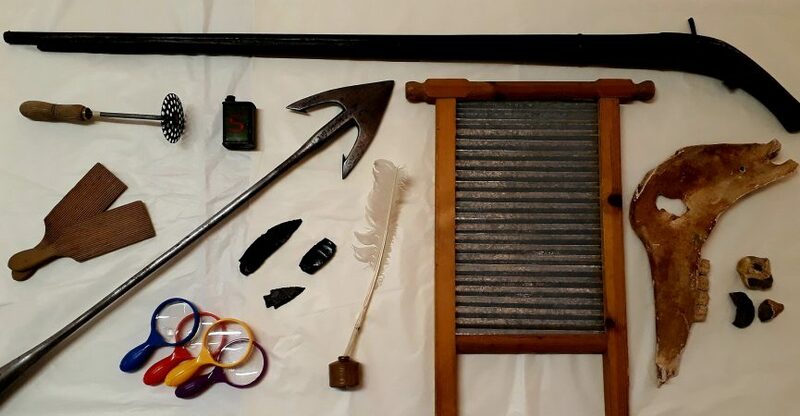 It is an interesting way of looking at these objects in a different light – not just looking on them as museum objects but also as useful items, in the same way that they would have been considered in the past. I also think we are gaining a fresh perspective on our collection by getting the young people to study them. 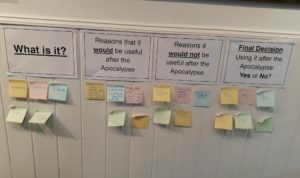 When we have finished the object selection, the pupils will make labels for the objects based on why they have chosen them for After the Apocalypse. I would also like to introduce a research element to this so they can provide more historical facts about them too. This can be done at the school or the museum. Keep an eye out for details of the upcoming After the Apocalypse exhibit in Montrose and to find out more about how the project is going. If you are interested in this project or have ideas for projects your organisation would like to engage in with schools, please get in touch with the DYW team who can support you to do this.